Converse Gigs @ 100 Club announce full line up for February show in partnership with The FADER! 2013 was a triumphant year for the people over at Converse Gigs - saw the likes of Joey Bada$$, Palma Violets and Enter Shikari pass through London's most legendary venue, and now Converse Gigs @ 100 Club is back with its first show of 2014. The FADER is an award winning publication based in New York - positioned as the the unofficial guide to what's next in music - is partnering with Converse Gigs for its first ever UK event. The show will be headlined by Blood Orange, known to some as Devonté Hynes who has produced a lot of music over the last 10 years, hopping from project to project and tweaking his sound. Hynes was previously a member of a group - Test Icicles and released two albums under the alias Lightspeed Champion before he embarked on his current project Blood Orange, which under sophomore album ‘Cupid Deluxe’ was released in November 2013 to widespread critical acclaim. Devonté Hynes has recently worked with Solange Knowles and Sky Ferreira amongst others. 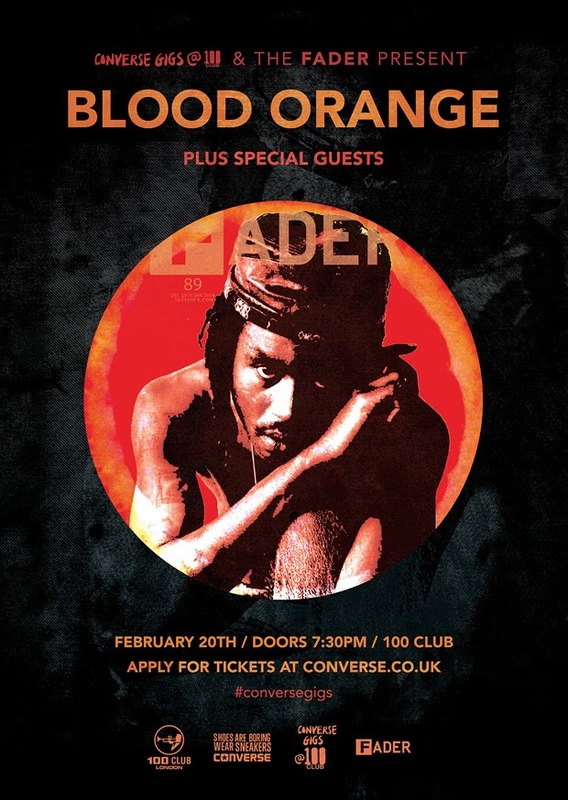 Having featured on the cover of The FADER’s Dec / Jan “NOW” issue, Blood Orange returns to his hometown to play this special event at The 100 Club. He will receive support from Stay Bless who will make an exciting addition to the show.